Let’s jump right into the core of the matter; Faye Crowe is a talented artist (she’s also an award-winning architect). 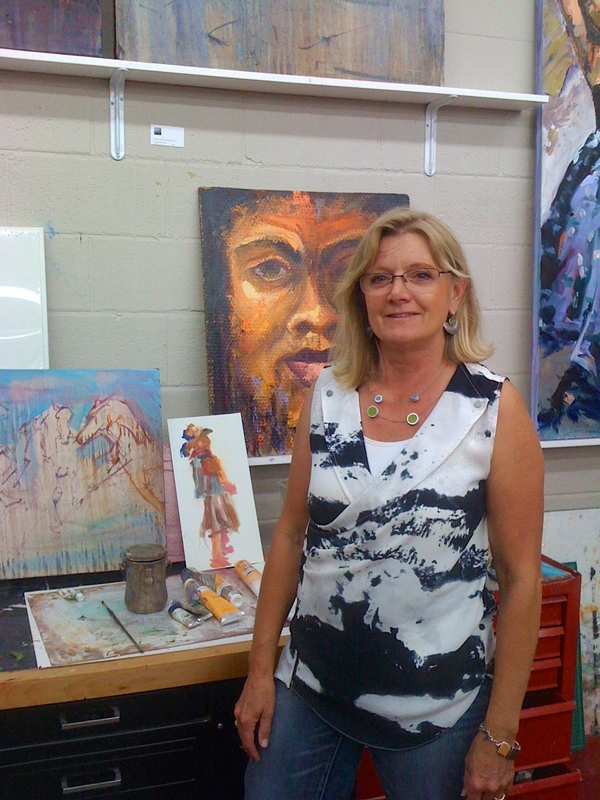 When I step into her dual-purpose business and art studio, I’m blown away by the oil paintings on the walls. A series of landscapes in the rear of the space take on an almost abstract, varnished quality and the use of color is inspiring. Additionally, I’m drawn to two side-by-side cowboy paintings. Tucked away in one corner, they appear almost as an afterthought but again the vibrant use of color combined with strong brush strokes draw my eye immediately. Faye standing in front of some of her pieces. Faye Crowe is a pleasure to talk to in person. She speaks confidently, but casually about her artwork, telling me that although she’s been pursuing art since before college, she took it up seriously about five years ago. “It’s a second career,” she confides to me, “and a passion.” Faye reveals that she’s influenced by her career in architecture, and by the beauty in the surrounding Colorado and New Mexico landscapes. “My paintings do carry an abstract bent,” she informs me. Faye tells me that with proximity to downtown Denver and the mountains, a diverse and beautiful mix of housing, and multiple options for travel including the new light rail line, the West Colfax Corridor presents an ideal location for her. She is just as enthusiastic when it comes to 40West Arts District. “I realized after my first meeting with 40West that this was going to be a dynamic group,” she relates to me. 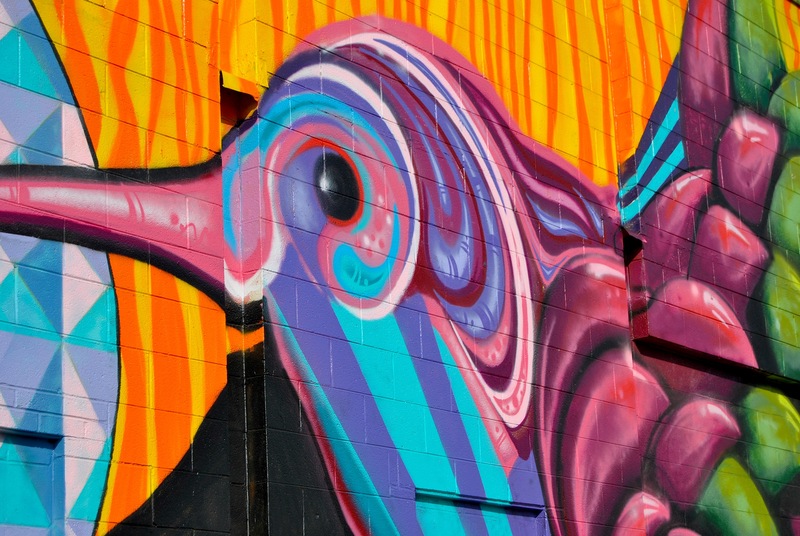 “I love the bragging rights – saying that I’m in the 40West Arts District. It’s a great marketing tool.” Faye also speaks to the work the Arts District is doing, telling me that it’s beneficial for both the neighborhood and for individual artists. Regarding both the West Colfax Corridor and 40West Arts, Faye decisively states, “Our time has come. 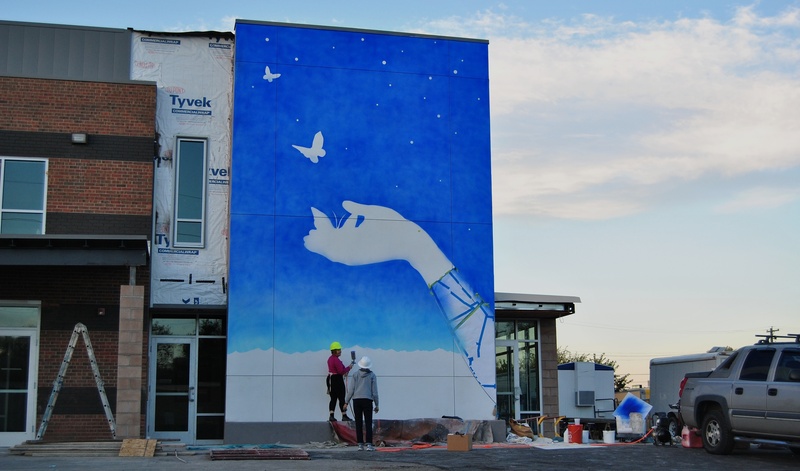 It’s time to be discovered.” And with our recent certification as a Colorado Creative District (read more here), the discovery of 40West Arts District is not just here and now, it’s official. Take a look at my pictures of Faye’s beautiful and dynamic space. 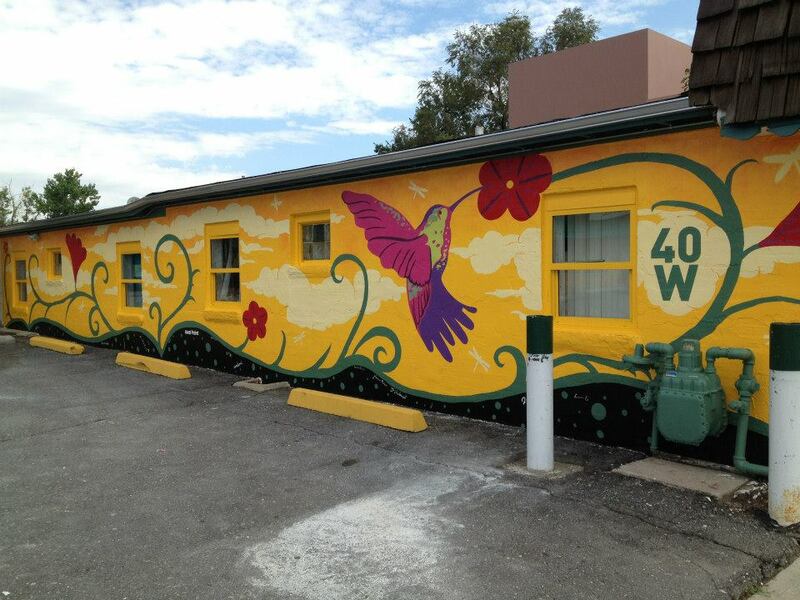 She’s right next to the 40West Arts Gallery and plans to hold workshops and art openings in her new space. Hours: By appointment only. Please email to schedule. Information on her website. A view from her office into the studio space. Faye’s materials stand ready to go. A side view of some of her many pieces. Landscapes take front and center stage on one wall. This large painting makes an immediate impact. Faye standing in front of some of her many pieces.